Digital C-type prints, printed in 2015 from colour transparency. Chris Harrison (British, born 1967) studied photography at Trent Polytechnic, Nottingham. Harrison’s work explores ideas of home, histories and class. In 1991 he was awarded a Northern Arts Production Award for the work Whatever Happened to Audra Patterson? The award led to an artist’s residency at the Viewpoint Gallery, Salford, resulting in the series Under the Hood (1994). Subsequent projects include Sites of Memory, which consisted of panoramic colour photographs of World War I memorials. These have been exhibited at the Imperial War Museum and Tate Britain, London, and the Deutsches Historisches Museum, Berlin. Harrison was granted a scholarship to the Royal College of Art in 1997. In 2012, he was awarded the 16th Bradford Fellowship at The National Media Museum which led to the work Copper Horses. For the project, Under the Hood, Harrison worked with a gang of boys and young men living on a council estate in Salford. Usually, residents of the estate viewed outsiders with distrust but with Harrison ‘the lads’ found a common bond: Harrison grew up on a council estate in the North East, and was of a similar age to the gang members. The title refers to neighborhood gangs and the fashionable labelled sportswear that is worn by these young men, despite their poverty, to show their status and the gang’s authority. In his images however, Harrison asks us to look past the exterior to the human beings beneath. The project began with Harrison’s fascination with the manner in which young men have been portrayed throughout history. He was particularly inspired by paintings by Caravaggio and Sir Thomas Lawrence’s Red Boy (1825), a copy of which hung in his grandfather’s house. Harrison followed some of the conventions and poses of Renaissance portraiture to show a different side to his sitters, who were often perceived as dangerous or on the margins of society. Harrison also chose to work in colour and in a studio setting, photographing the subjects individually and in small groups against a red velvet background. This deliberately reversed the expectation of a grainy, black and white style of photography, often made outdoors, that had become the dominant visual trope associated with urban subjects. Harrison’s photographs were published in the book Under the Hood in 1994. Curator Val Williams described the images as ‘One of the few photo series to emerge from the new British colour documentary, which neither satirised nor objectified a group in society, which saw itself as marginalised, bound into, and emerging from, a culture of poverty and lack of opportunity.’ The sitters’ expressions are not so much challenging as thoughtful and inquisitive, showing an exchange of gazes which are both wary and proud. Harrison’s photographs reclaim status for those judged by society to be worthy of none; ‘You’ve made us look brand new,’ said one sitter when he saw his portrait. Under the Hood was exhibited at the Viewpoint Gallery in 1994, and then at the 1998 Rencontres d’Arles photography festival, Arles, France. The recent murder of Paul Maney (one of Harrison’s sitters for the project, though not represented in this selection) has highlighted the ongoing problems of gang violence. These photographs focus on underrepresented people outside London towards the end of the 20th century. They form a continuity and development from the V&A’s collection of UK black and white photographs by various photographers from ‘New Society’ magazine, 1960’s - 1980’s, and with Chris Killip’s photographs of the working-class north east, published as In Flagrante (1988). As I sit writing this, the Hillsborough verdict has been announced. I have been trying to remember what I was like when I was 25 and the explicit reasons as to why I did the project Under the Hood as I did. After 15 years of living in Norway, how was it to be working class in Britain? And suddenly there it was in that verdict, a truth that any football fan knew. We were treated as the other in our own country; a problem to be managed, contained, lied about and lied to. I realised that it’s almost news from another country, but it’s not, it’s Britain and the bias and contempt of the working class is institutional. Britain has never had to have a conversation with itself as to what sort of society we wish to be and my work is one small push in that direction, one small piece of propaganda for the working class. This was the background in which I undertook my project. In 1993, Simon Grennan, one half of art duo Grennan and Sperandio commissioned me, through Viewpoint Photography Gallery, to come to Salford and photograph whatever I was interested in. Simon had seen a feature in the Independent Magazine on my first exhibition after graduating from Trent Polytechnic, Whatever Happened to Audra Patterson? Using a school photograph as a starting point, I had photographed everyone whom I had been at junior school with in Jarrow. It was the first stage in a practice based on misrepresented British culture via class, memory and personal history. When I went to Salford I knew I wanted to photograph young men much like myself. Working on the Audra Patterson project had sharpened my conviction that my work is a response to the dichotomy of the world as it’s presented to me, and how in reality I perceive it. The standard way of doing things in photography couldn’t tell the stories I needed to tell and since I’m outside of the dominant narrative, I had to use the language of photography against itself. Coming from a solidly working class background my experience when I went away to polytechnic in 1987 had been a massive culture shock and to an extent, an eye-opener as to how people like me were viewed both literally and in visual culture. I quickly realised most documentary photography was biased, however well intended. From the type of work shown at the Side Gallery of grainy black and white poor people to the student work I saw around me, the language of the other was used to describe people who were my friends and relatives. I needed to develop a new language of photography specifically to counter the “grim up North” stereotypes and to confront the chaotic visual language so readily employed to describe the working classes. In Salford I met Sean Keating and we immediately hit it off. Sean was on probation after a spell in Strangeways Prison and as part of his rehabilitation was trying to make a film about Salford life. We were the same age and background and were both interested in showing working class life in a different light. When I first described what I wanted to do, Sean told me the story of the photojournalist from the Observer who came to Salford, which had recently suffered from riots and took a snapshot of Sean in front of some graffiti featuring a policeman being shot. I understand news agendas and time constraints and I can almost hear the editorial conversation, but I still get upset at the lack of enquiry and the lazy assumptions. Even Sean knew straight away that it was a mistake, which gives lie to the idea that we are unaware of how imagery is used to oppress and control. Sean introduced me to his friends who, it turned out, consisted mainly of members of The Salford Young Firm, one of Greater Manchester’s up and coming criminal gangs. Consisting of sons and younger brothers of the established Salford organised crime gang, these lads were Thatcher’s Children writ large. I spoke with Paul Massey who was the leader of Salford’s organised crime and he told me that in his day people had been socialised by apprenticeships and surrounded by working men; it was then a deliberate choice to follow a life of crime. With the destruction of that society these young lads had lost natural mentors and had little choice but to be enterprising, even if that meant that the bike they got on was someone else’s. They were a creation of wider society´s breakdown in the 1980s, not a spontaneous phenomenon due to a sudden lack of personal responsibility. To make the photographs I was able to use the Phoenix Theatre in the middle of the Pendleton Estate, which had been built in the 1960s with the idea that culture could be imported in. It hadn’t been used much, but lately Sean had been organising popular club nights for the local youth and so he had some influence with the local council. I set up in the stage area, which had a high ceiling and used a single large flash with a large soft box to mimic window light. To further give the impression of it being an interior, I had a table on its end as a light flag. Finally, and with a very deep breath, I took the plunge and went to Manchester market and bought some cheap red velvet to use as a backdrop. The effect was to act as a trope of grandeur and status. My Grandfather had retired from his factory job the year I was born and as a present the men all chipped in and bought him a print of the Red Boy (Master Lambton) by Sir Thomas Lawrence. There was something about the ease of Master Lambton that even as a child told me exactly what to think and that stuck with me. I had later done a fair amount of research on historical paintings and realised they would often contain drapes for various classical reasons. I began to assemble a collection of postcards from museums and galleries to have with me, paintings by, among others, Titian, Zurbaran, Durer, Hals and Rembrandt. The one artist who really gripped me was Caravaggio whose portraits of real people as real saints and sinners had the most significant impact on me. The central premise of using actual fishermen, actual carpenters, rather than idealised representations informed my work more than anything else. It was clear to me that I had to draw out the tension between an immediate response to the surface and to ask questions about a response to the actual subject. I had observed that people often just read the surface of imagery and that a grainy black and white photograph was the only signifier of what was in the image. If something was beautiful and colourful that meant something else regardless of the content. People wanted shorthand and to be told what to think, by subverting those conventions I would hopefully get people to think for themselves or at least draw out the innate prejudice that we all carry around subconsciously. The visual language was there almost from the very starting point. Apart from a few test shots that were too light the shooting style was established quickly. The use of the opulent, red velvet backdrop; there to point to and make clear the importance of pride in display, the natural window light to give a sense of intimacy, and the fact that the people are wearing their own clothes. The velvet backdrop also acts as a barrier concealing the harsh reality of life beyond, shielding you from all of your key indicators and triggers and forcing you to see them as full members of society rather than dismissing them as “chavs”. Getting people to pose wasn’t as easy as I initially thought and there were never any organised shoots. In Salford, a deep-set suspicion of people’s motives meant it was a closed community and everyone was in some respects rightly paranoid. 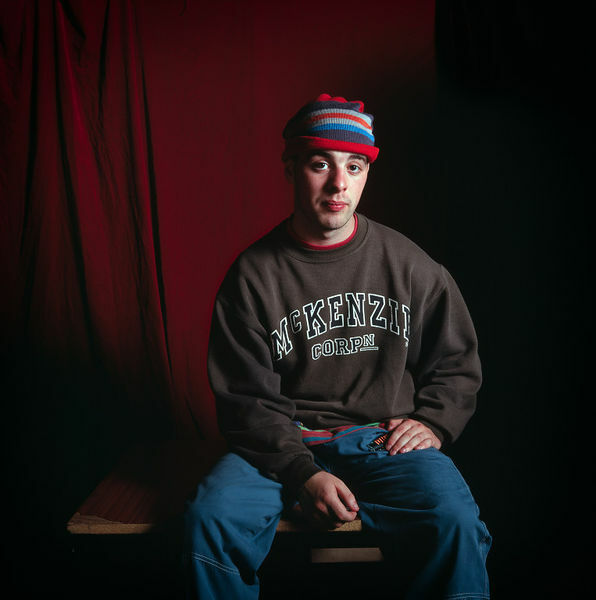 After setting up the studio space I found myself sitting on the wall outside the theatre alongside Sean and meeting groups of young lads who were also hanging around and occasionally someone would agree to be photographed. Gradually the word went out that it wasn’t some bizarre police sting operation and occasionally people would go and fetch friends to come in and have their photos taken as well. When lads would come in I would explain what I was about, what I was after and show them some of the postcards that I carried in my camera bag. They were always engaged and often as not, easy to work with. I never asked anyone to dress a certain way I wasn’t interested in styling them. The only intervention I made as I photographed them was to adjust their poses slightly. Using the postcards I had with me as a guide I would perhaps get them to move their arms slightly or arrange their hands differently, small things that in painting expressed the power of the sitter. Often the lads hadn’t posed for any photographs other than a school photo so their body language was attuned to survival on the streets, a phrase that may seem trite, but that reflects a reality of not wanting to seem either a threat or to appear a victim. Too much trouble, like the multi-coloured jungle frogs. I used Fuji Velvia 50 asa transparency film and I usually shot between 3 and 5 rolls of film per person. There was something about the unforgiving nature of transparency film that I liked; it’s part of my upbringing its either right or wrong we don’t go in for sophistry. Velvia was a film that had a pronounced warmth and was very definitely not ‘new British colour documentary’ film - as Martin Parr said to me when he heard I shot transparency film, “you old fashioned bugger you!” My main influence in colour photography was Larry Burrows, a photojournalist who worked and died in Vietnam and who maintained humanity in his work, avoiding the easy clichés or politicised polarity of many of his contemporaries. C-type colour digital photograph depicting a young man posed against a red cloth backdrop. He wears a 'McKenzie Corporation' brown sweat shirt, blue trousers and a striped brown, blue and red beanie. He sits on a table, and stares at the camera. Williams, Val, Tony Levy and Chris Harrison, 'Under the Hood', Viewpoint Photography Gallery & Artbase Studios, Salford, England, 1994.